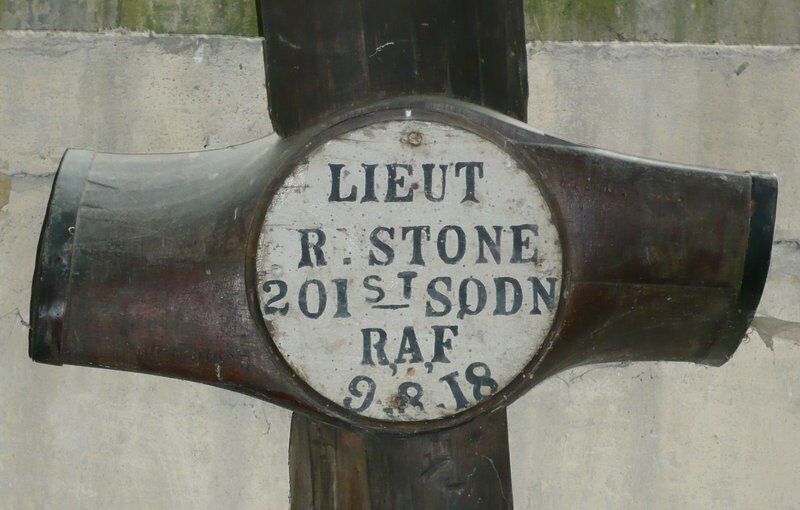 In the Ringing Chamber of the Church of St Nicholas, Piddington, hangs a cut-down First World War aeroplane propeller, which is dedicated to the memory of Lieutenant Richard Stone, known to his friends as ‘Stoney’. Lt Richard ‘Stoney’ Stone was killed in action in France on 9 August 1918. He was flying a Sopwith Camel D6250 in formation with a Lt Wood while supporting British ground forces as part of the Amiens Offensive. Stone and Wood were engaged in a battle near the village of Rosières. They attacked the enemy positions in nearby woods, when they themselves were engaged by enemy planes (Fokker D.V11) but managed to lose them. Both pilots returned later to the same area and were engaged in attacking enemy troops retreating from the British advance. Again they were attacked by enemy planes, but this time Stone’s aircraft was hit, and spun to the ground, crashed and caught fire. Stone did not survive. Wood managed to return to his squadron at Poulainville. They had been airborne for only 50 minutes. Lt. Stone’s body was recovered from the crashed aircraft by OC 3 Field Company Australian Engineers, who were in that area. He was subsequently buried at Heath Cemetery, Harbonnières, France. Richard Stone was 19 years and 5 months old when he was killed. He was born on 12 March 1899. He received his ‘wings’ on 5 February 1918, and was promoted to Lieutenant in April. In the same month he was posted to 203 Squadron RAF, which was operational in the St Omer area. During this time he made eleven ‘war flights’. On 8 August, Lt Stone and two other pilots were transferred to 201 Squadron to reinforce them with experienced pilots on the Amiens–Montdidier front. There a British offensive had begun. They arrived at their new squadron after midnight, on 9 August 1918. Sometime after the war had finished, troops – many from the Commonwealth – were on their way home via the UK. Lt Stone’s father, John Morris Stone, a barrister in Lincolns Inn Fields, London, had an unexpected Australian visitor to his chambers. The visitor, an Australian soldier, stated that he had recovered a signet ring from the crash site. The ring was undamaged apart from a burn mark. Having traced Lt Stone’s father via the coat of arms on the ring, the soldier was able to return it to its rightful owners. To this day the ring is still worn by a family member, it having been passed down over the years. Lt Stone’s father, it appears, was so taken by the moment he did not obtain the Australian soldier’s name or details. It was thy will, O God. And so he died! To be with Thee for ever, by Thy side. His memory with those he loves so well. With whom he lives in happy ecstasy. The Stone family history covers our part of Oxfordshire since at least the 15th century, as they were extensive land owners and farmers in and around Piddington. There are members of the family buried within St Nicholas’s Churchyard. We would like to thank Cross & Cockade International, the First World War Aviation Historical Society, for information, some of which was printed in their journal, volume 34, number 4, 2003. We would also like to thank RAF Museum Hendon for their help. J. Howard Brown and William Guest’s History of Thame (Thame: F.H. Castle, 1935) mentions the Stone family. In 2007, Pamela Newall of Ambrosden, a bell-ringer at St Nicolas’s Church, started the investigation into the propeller shaft; without her diligence, the history of Lt Stone may never have been uncovered. Lastly, thanks are due to members of the Stone family, who have been so helpful in filling in parts of a story that might have been lost forever. In turn, bringing this story to light, after so many years, will allow a new generation to learn about a past hero in their family.